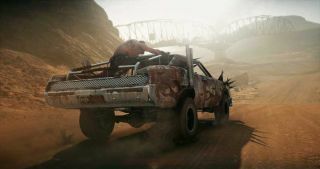 We threw 20 minutes of Mad Max footage from Gamescom in your sand-blasted thirsty faces last week, demonstrating some of the riding, scavenging, and punching you, as the titular madman, will do in Avalanche Studios' post-apocalyptic Australian outback. But if you need even more, well, here's that too. 80-plus minutes more, to be precise, courtesy of GamesHQMedia, in which Avalanche's Odd Ahlgren (I really hope I got that right), Emil Kraftling, and Kristofer Labedzki go bombing around the desert in a very banged-up version of the Interceptor. There's some shooting, some fistfighting, some explosions, a look at the top-down map, and of course lots of high-speed cruising across the blasted sands. I don't have an hour and a half to watch the whole thing so I can't give you much more than that, but I doubt you'll see too many surprises in here, beyond the obvious upgrade to Max's pugilistic skills. He sure didn't fare this well against the Warboys in Fury Road. Mad Max is out on September 1.